EVEN hotels are jumping on the wellness bandwagon!! Recently I experienced another perspective on occupational wellness, the perspective of the work traveler. It is pretty hard to focus on your wellness when you’re on the road, spending too much time in airports, hotels and meeting rooms, having limited healthy food choices, and being too strapped for time or too tired to fit in any exercise. I was pleasantly surprised by the Even Hotel in Rockville, Maryland. Assuming the hotel was chosen by an outside logistics contractor due to its proximity to SAMHSA Headquarters, my expectations were set relatively low from the get go. After a delayed flight and terrifying taxi ride in pretty heavy rain, we entered the bright, clean lobby and immediately spied a row of lovely glass water dispensers featuring not only ice cold filtered water, but several different flavored waters including, my new favorite, ginger-lime. Things were looking up! As we were being checked in, I noticed several inspirational or catch phrases painted on the walls, like “A refreshing change of space” in a casual seating area of the dining room, and then in the elevator, “You can push my buttons”—you gotta smile at that. As I opened the door to my room, I was thrilled to see the words “Dream Big” painted over the bed. The room was “wellness appointed” (see pictures). 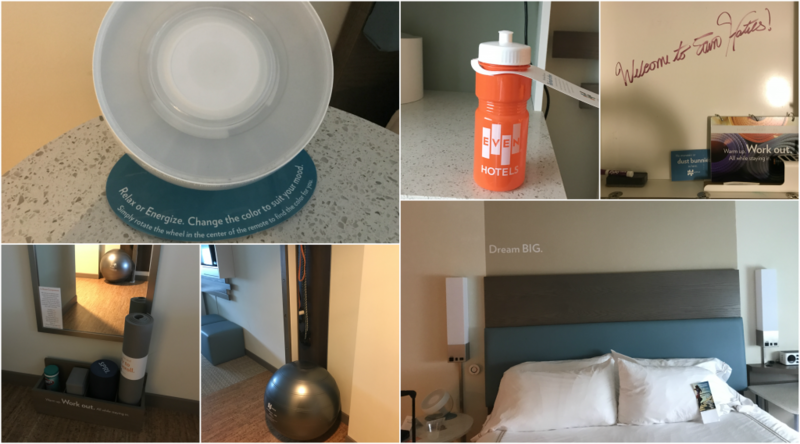 On the bedside table was a “mood light” that you could adjust based on your desired mood, in-room exercise equipment, including a balance ball, yoga mat, exercise bands, etc., and there was even a complimentary re-usable water bottle on the countertop. And there’s more…. Later that evening when we returned from our first meeting and an early dinner, I turned on the TV and the guide revealed that the first several channels were all instructional in-room workout videos ranging from 10-minute workouts to 45-minute workouts. The hotel also provides free laundering of your workout clothes during your stay. Admittedly, I did not need to use the laundry service, but I did watch an entire episode of Criminal Minds while sitting on the balance ball…and yes, I bounced around the room a bit. I may not have burned many calories, but my stress level decreased exponentially, and I had a very good night’s sleep, which I rarely do on the road. I think a wellness-themed hotel is a fabulous idea and hope that other hotel chains get wellness-inspired too!